In a unique brainstorm session, participants identified topics and hosted their own small-group discussions in an open-space format. They shared common challenges and action steps for better engaging customers, while being encouraged to think visually. Whether you’re launching a new venture or adapting your business to changing times, here are some useful ideas from your fellow GMCVB Partners. 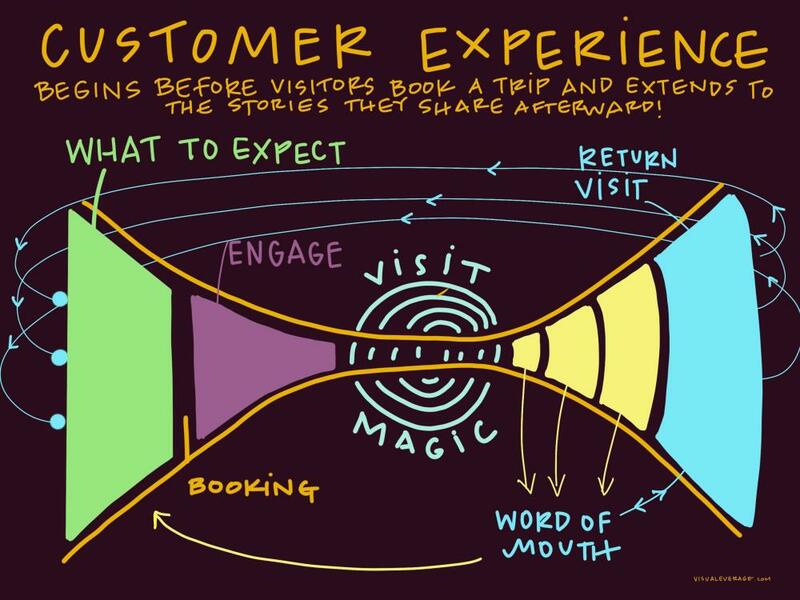 Start shaping customer expectations well before they book or arrive at your destination. On your website and social media, clarify what’s available and what to expect. Include videos of customers at events, sample menus, custom tours or events you offer, and whether they need reservations or can drop in. Be detailed without information overload. Engage the audience in person, not only online. Partner with other local businesses for referrals. “Givers gain” by referring clients to others in their industry you can build trust, treat your clients well and establish good report with peers who may refer you in the future. Be intentional: Truly consider who is a good referral before you connect them. Plan the connection: Who to meet, how/where to meet, what you’ll offer them. Attending an event? Invite someone to join you. Consider creating package deals with other GMCVB partners, non-profit organizations and rewards programs. Share what others are doing on social media, as well as your own activities. Arrange special openings and previews – ask businesses about after-hours shopping opportunities to showcase your product (and theirs). Send a professional/personal email or quick informational/inspirational note now and then. Handwritten notes are memorable. Consider writing a script or talking points about your business so management and staff present a consistent message. Stand out with your branding. Be different, creative, passionate and tangible. Want people to jump around at your event because they’re having such a great time? Show people jumping around at past events! Use customer testimonials. Promote the face of your company, whether it’s a standout chef, comfy beds, barnbusting cheeses or a sports team, mascot and fans. Convey how the experience exceeds common expectations – e.g., more than “just food and beverage,” they’ll experience inspiration, discovery, fun, creativity, physical energy, pampering, personal connections and more. Next month in Business Builder Monthly: How to assist and inspire your staff as they engage customers. The Fireside Theatre’s history reaches all the way back to 1964. Tell us about how the theatre began and how it has evolved into what it is today. The Fireside began as a small restaurant with unique architecture and décor committed to a top quality dining and hospitality experience. What is your inspiration behind the theatre’s cuisine? Give us a little background on what your menu has to offer. The menus change with each show as we have many guests that return to see each one. Besides these Featured Menus we offer our Thursday Evening Signature Buffet, Sunday Brunch Buffet, and alternate upgrade entrees on the weekend. Accommodations are made for Vegetarian and Gluten Free dinners as well as any other special needs. With the holidays right around the corner, what kind of unique items are sold at the four Fireside Theatre gift shops? There will be about ten different themed trees with coordinating merchandise ranging from Old World glass ornaments to Woodlands, Peacocks, Snowmen, Religious, and Farm themes. In addition to the holiday merchandise the shops feature Brighton and Lizzy James Jewelry, Jim Shore collectibles, a wide variety of home décor and children’s gifts, plus Packer, Badger, and Brewer merchandise. 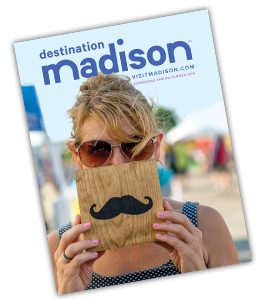 Being part of the Greater Madison Convention and Visitors Bureau allows us to reach Madison area visitors and tour groups that may be willing to drive a few extra miles to enjoy Broadway quality theatre available seven times weekly year-round. We particularly appreciate being included in the online calendar of events. Tell us about some of your exciting shows coming up in 2019. 2019 kicks off with a LEGENDS IN CONCERT partnership featuring tributes to six Country Music superstars. More great music will be featured in our original live band revue in the summer and Buddy – the Buddy Holly story in the fall. Classics include My Fair Lady, Annie, and the new musical stage version of A Christmas Story. 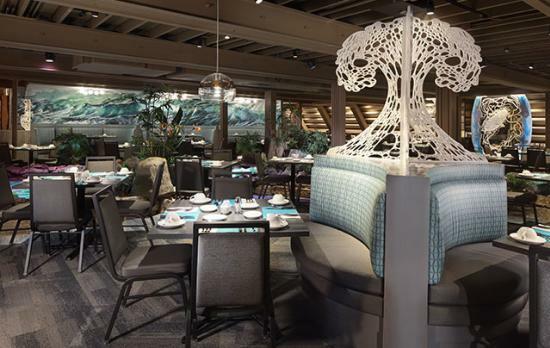 Since transitioning to the third generation of Klopcic Family ownership in 2015, The Fireside has been undergoing a complete facility renovation. Much of the work is complete and if you haven’t been here lately we’d love to have you see our new looks! 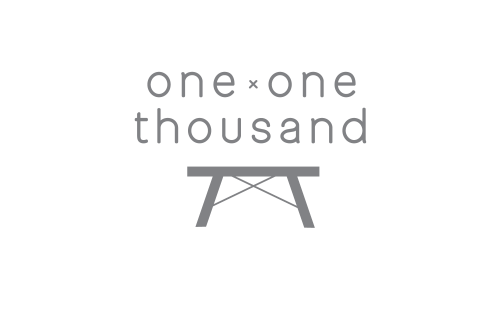 Creative studio, curated retail experiences & community around handcrafted home & lifestyle goods and the people that make them. Noble Knight Games has the world&apos;s largest selection of tabletop games! Come visit our castle in Fitchburg and play in our brand new 5500 square foot store and play area! OPENING JANUARY 2019: Come experience our new Sleep Inn & Suites by Choice Hotels in Oregon, WI. The warm colors, soft lighting, nature-inspired designs and modern furnishings throughout our hotel will help you feel well-rested and happy. 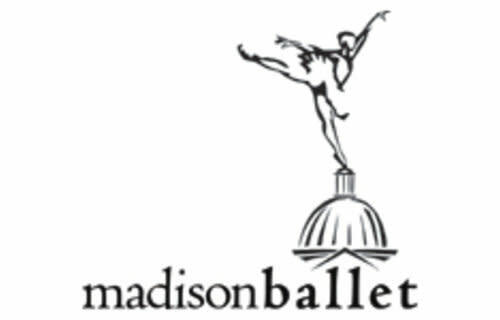 Madison Ballet presents world-class ballet with passion, creativity, and athleticism to the greater Madison area. The School of Madison Ballet offers classical ballet training to dancers ages 2 to adult.